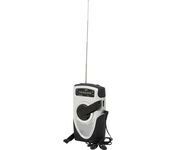 Built in hand crank power generator makes this a great radio for all emergency and out door situations. One minute cranking provides up to 30 minutes of useage. Alternatley, the radio can be powered by 2 AA battiers(not included). AM/FM and Weather Bands. Telescopic Antenna, Ear Bud Headphones, and Carrying Strap included.